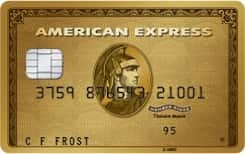 New American Express® Gold Rewards* Charge Card Cardmembers can earn a Welcome Bonus of 25,000 Membership Rewards® points just by making $1,500 in purchases in the first three months of Cardmembership. That’s enough to redeem for a round-trip Fixed Mileage Flight Reward TM* to almost anywhere in North America. Earn 2 points for every $1 on eligible travel and everyday purchases. Earn one point for every $1 in Card purchases everywhere else. This CAD currency 8 is issued by American Express and runs on the American Express Network. The purchase interest rate for this credit card is: 30 percent annually and the transfer balance interest rate is: % per year. Also the cash advance rate is: 3% per year. Travel cancelation is Not available for this credit card and also travel accidents are Included.